Did you know you can train gerbils to do tricks and tasks? To run obstacle courses? To learn Mazes? Gerbils make great pets and can do more then just sit in a cage and run in a wheel. The more time you spend with your gerbil the more time you will want to spend with your gerbil....if you train and the gerbil learns to learn, you will be amazed at how these little bitty pets will preform for you. When my husband's two sons were young, I think they were like 10 and 8 years old, they each had one gerbil. The gerbils were cage mates so when one got out to be played with, the other did too. The boys got the gerbils out at least twice a day and many days spent hours with their pets. They taught the gerbils to run an obstacle course, and to "hang with them", meaning the boys could set the gerbils on the table that they boys were playing games on and the gerbils would stay on the table near their owner. My husband had cut a 4' x 8' piece of plywood in half. Then he cut one half of that into pieces...so that the 4' x 4' sheet of plywood had sides, on one side of the board the sides were 10" tall, on the other side the boards were 2" tall. 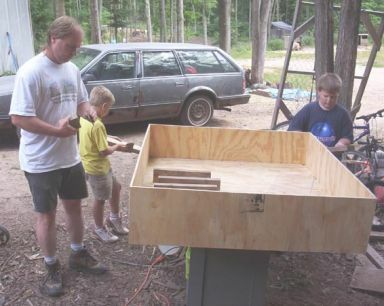 We used this Small animal Playground (the plywood "room") a lot. The boys would have each of their gerbils in a wheel car, the ones where the gerbils are put into the wheel to make the little car go...and have races. The boys also had the excersize balls that the gerbils ran in. Many times the boys would set up a playground for their gerbils with toys and wheels and short sections of 2" x 4" boards. Frequently the boys would make mazes or obstacle course for the gerbils with pieces of 2" x 4" board we had laying around (we were building at the time. The 2" x 4" boards were approx 4" long to 14" long. The gerbils really seemed to enjoy the mazes. We got such a kick out of one, if it could not find "the way" it would jump over the boards and continue looking for the treat at the end. Make sure all tasks, tricks, courses, all any other events you would like to do with your animals are safe and practical. Do not ask your animals to do things that is beyond their ability. Make sure your training area is safe for your animal and in an area free of dogs, cats and birds of prey, as well as small or misbehaved children so that the small animal is not harmed. Any training you do with your animals is your responsibility. We only tell of what has worked for us with our animals. We can not and will not except responsibility for something so far out of our control, people we do not know, training, who knows how with animals we have never seen. The contents of this page for More Fun With Gerbils is still under construction. Please check back later!